are a fantastic buy for the money. Each and every Rockford amp is CEA-2006 rated, which means each and every amplifier is guaranteed to produce the power that's listed in the specifications area. Wanting to hook up two pairs of top quality car or truck stereo speakers? You'll need a 4-channel Class A, Class A/B low distortion 4-Channel amp from Rockford to achieve the most from your speakers. 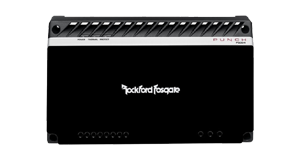 Rockford Fosgate currently has three different series of amplifiers the Power, Punch, and Prime series.